Introduction: We have previously documented a 100% certification pass rate immediately following a proficiency-based skills training curriculum for the Fundamentals of Laparoscopic Surgery (FLS) program. 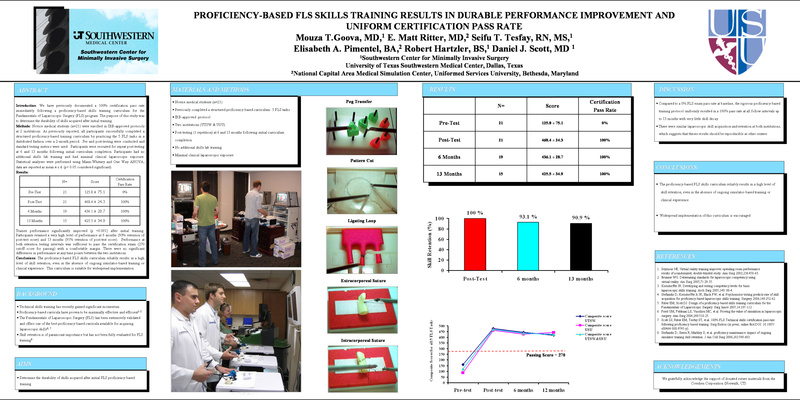 The purpose of this study was to determine the durability of skills acquired after initial training. Methods: Novice medical students (n=21) were enrolled in IRB-approved protocols at 2 institutions. As previously reported, all participants successfully completed a structured proficiency-based training curriculum by practicing the 5 FLS tasks in a distributed fashion over a 2-month period. Pre and post-testing were conducted and standard FLS testing metrics were used. Participants returned for repeat post-testing at 6 and 13 months following initial curriculum completion. Participants had no additional skills lab training and had minimal clinical laparoscopic exposure. Data are reported as mean ± s.d. (p< 0.05 considered significant).